This photo was taken in the summer when my hair was quite obviously longer and blonder, my skin was browner and Albi was whiter (it looks like he'd just been to the groomer's ;) This is my all-time favourite style of dress to wear. I actually own about three of these and everytime I wear them I get compliments for the simple reason that it's very flattering on my body shape. If you have a small waist, a bigger bust and equally proportioned hips you are an hourglass shape like me...and you should buy about 13 dresses like this. Okay, that's a slight exaggeration but seriously it will work wonders for your figure! Thick defined waist band, simple tank top, A-line skirt...anything that fits that description will highlight all your best features and conceal anything you don't like. Trust me! Don't mind the strange pose...this picture was taken with my tripod :( Boo-hoo! Anyhow, if you are a boyish shape and have little or no curves, a smaller bust & hips or are shaped like a ruler this style of dress will look amazing on you. The higher neckline is something I battle with (because I enjoy wearing it...but it can make my bust look like a shelf if worn with the wrong bra). I have to wear this with a balconette bra or something that sort of "minimises" my bust. Here's another picture of me from a few months ago with lighter and shorter hair :) In all honesty, the wrap dress looks the best on apple shapes but I don't own one to show you guys! However it's a really good style of dress for making the mid-section look smaller. This dress works too though, because of the v-neck (flatters a big bust), the zipper (elongates the body) and the slight definition at the waist works a lot better than a thick waist band, which has the tendency to make apple shapes look bulky around that area. And the best thing about this dress?! It has pockets!! I go wild for dresses and skirts with pockets...as does my mom. We're a little crazy, if you haven't already been able to tell. My registry office wedding dress has FREAKING POCKETS *sparkly eyes*! Why do pockets tend to work better for the apple shape? Because they are a little bit bulky and will balance out the shape. This is possibly the worst picture of the whole post because it does not show off the dress AT ALL, however it's the only one I could find of me wearing it! It's an empire line dress with a v-neck and it ties at both sides with little bows. But you'll just have to take my word for it... The empire line is the most flattering style for pear shapes because they make your bust look bigger and skim over the lower body. This particular dress comes to above the knee. Also, the bows on either side sort of "pad out" the upper body so the shape looks more in proportion. 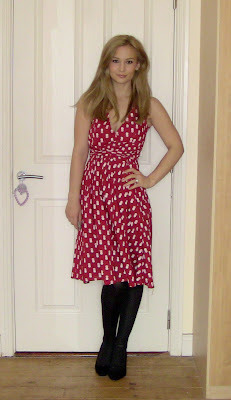 I don't love this dress on me...and I suspect it's because I'm not pear shaped. I do think it's pretty but I don't think empire lines are the most flattering on my body type! Oh yes and this picture was taken about 2 years ago on New Year's! This is NOT actually the dress I showed in the video...because I don't have a picture of me wearing it. But it's the exact same style so here you go! I absolutely love this style of dress on a full-figure because it is super flattering and I feel like you can't go wrong wearing it! This hits you in all the right places...the v-neck is good for bigger busts and arms, the defined waist hugs in your curves and the A-line skirt flatters bigger hips. Even the length (just to the knee) is perfect. The dress I originally wore in the video is from Anthropologie and it was my 18th birthday dress. I really love it, and I want to get it taken in because it's now too big for me (I was about 15-20lbs heavier as a teen) and I've only worn it once! :( But it's beautiful and everytime I see it hanging in my closet looking all forlorn it makes me sad! Hopefully this mish-mash of photos wasn't too confusing and you found it helpful in one way or another. Remember these are by no means RULES to live by, these are just some helpful hints and tricks that I have learned from experience with styling different body shapes. Wear whatever makes you feel good! Let me know what your favourite style of dress to wear is!